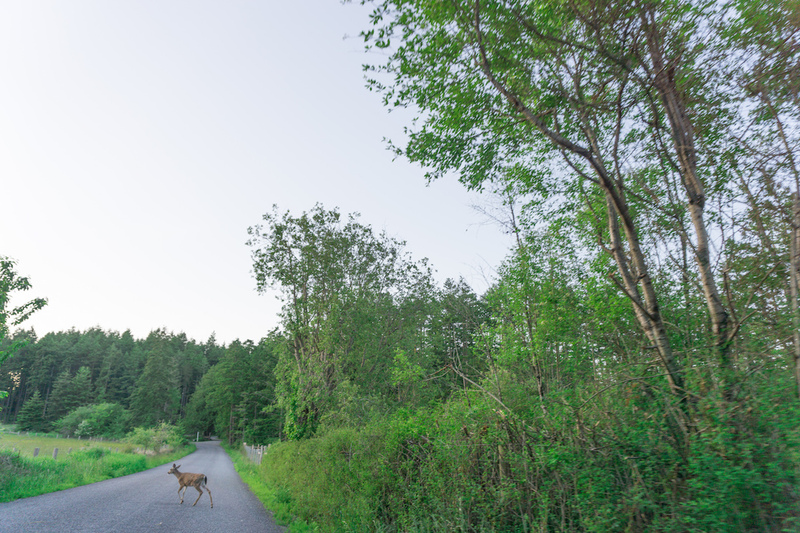 Picture this : A drive down a quiet tree lined road, winding around first a pretty lake, then a field of cows, gently slowing down for a deer crossing the road, gently, because you have slowed down anyway, as is the custom on this island. The only thing to interrupt your thoughts, and casual bovine encounters, is an orange sunset magnificently gracing the background. Is this England? Not quite, you are still in the United States, in the upper west corner of Washington. This is Orcas Island, the largest of the chain of San Juan Islands in Washington, closer to Canada than it is to Seattle. 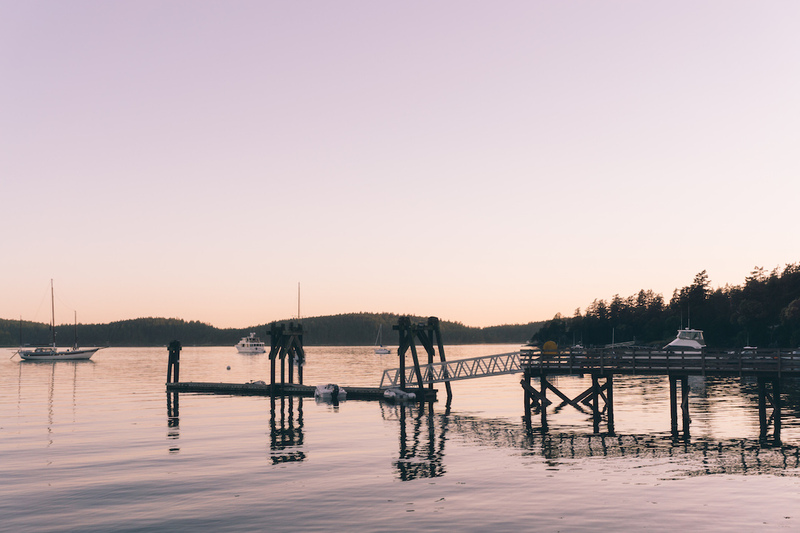 A long weekend is the perfect amount of time to spend on Orcas Island for a relaxed retreat, a weekend is long enough to explore the island. 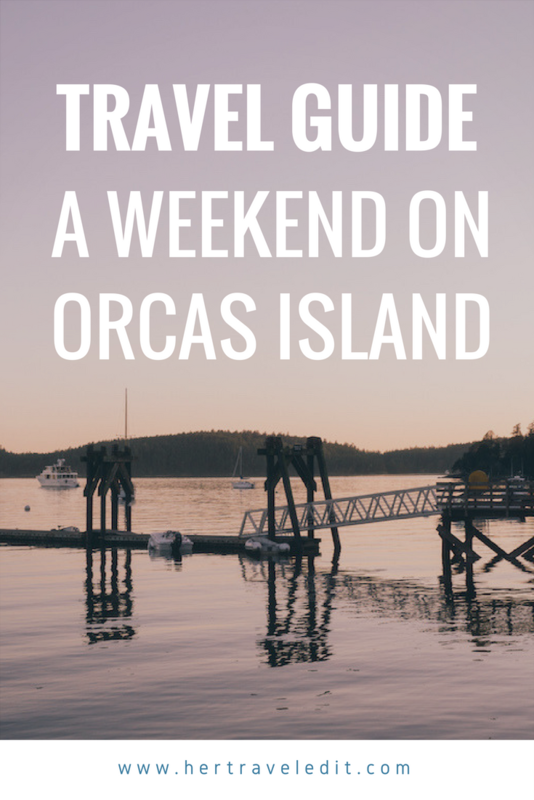 This guide will help you spend your long weekend on Orcas – feel free to mix and match, and add and delete as your time and preferences allow. 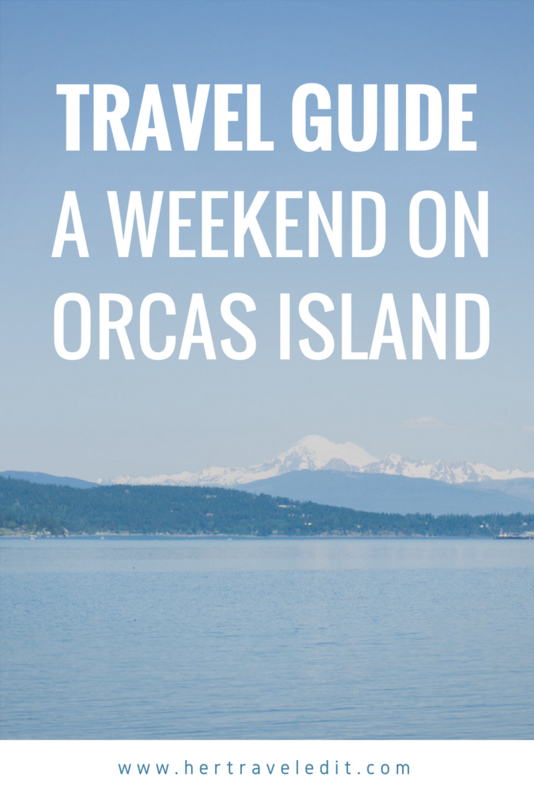 There are a few ways to actually get to Orcas Island. Fly to Seattle, Rent a car, Drive to Anacortes (about two hours away from Seattle) and then drive on to the ferry with your car to Orcas Island. This was the path we followed. The drive from Seattle to Anacortes should technically take about an hour and half, but it took us over two hours due to the traffic. This route seems pretty heavily trafficked on the weekends, so check the traffic situation before you leave. 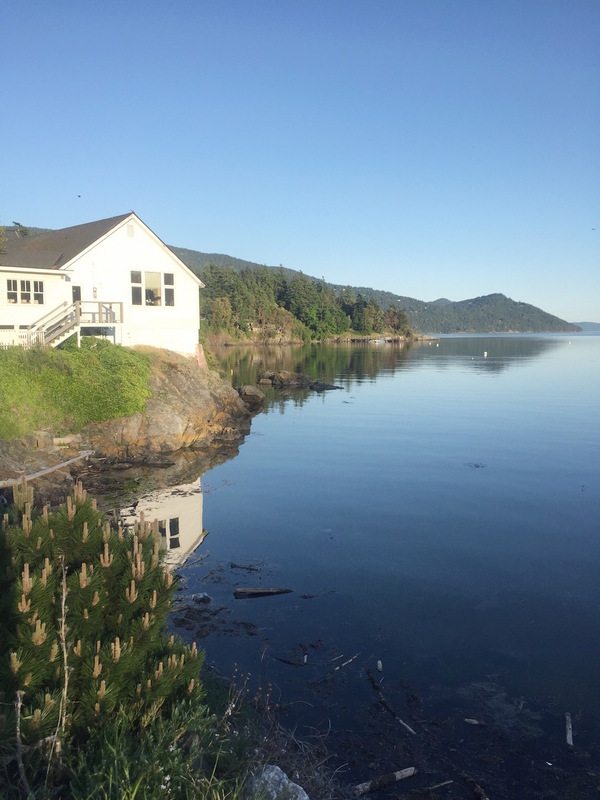 My tip is to veer off I-5 N and instead take the country roads that pass through farms and flower fields and red barns and tiny towns – this will give you a little taste of what to anticipate at Orcas Island! In order to ensure you get on the ferry, you make reservations for your car at the WSDOT reservation site. If the ferry you want is no longer available, know that they release only 30% spots two months before the date, then 30% spots two weeks before, and finally 10% more spots two days before. However, if you are leaving it to the last minute, get on exactly at 7 am PST on the release day to snag your spot. We experienced that they go within minutes on a popular weekend! Now this reservation is just for your car. Once you have it, you can just pay for the passengers when you get to the Anacortes ferry dock. Plan to be at the Ferry Terminal at least 45 minutes before your ferry departure, because you have to pay and get past the checkpoint at least 30 minutes before the departure time. After you pay and get past the checkpoint, you will have to line up your car for the island you are traveling to, and at this point, you could potentially leave your car to head to the restroom / see the ferry terminal / enjoy the views etc. They will make announcements when they need you to get back to your car. 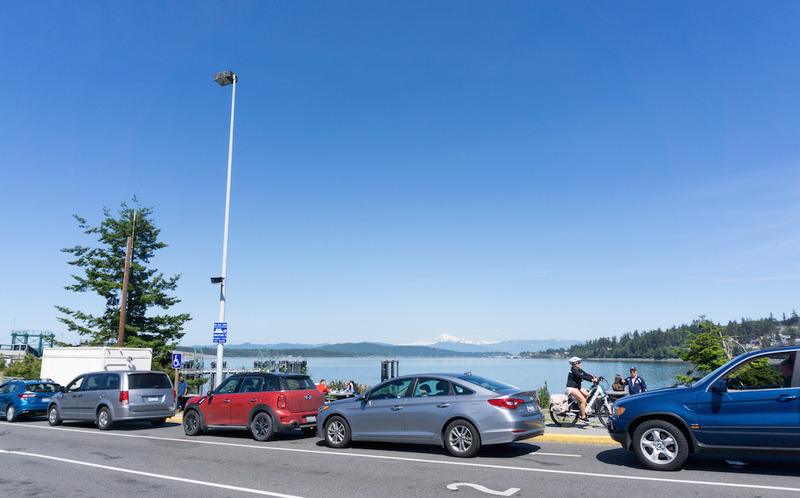 Once you drive on to the ferry and park your car, you are free to get out and enjoy the ferry ride! They do have food on the ferry, but I recommend you carry your own…pick up some fruits and pastries from Pikes Place market perhaps? Bring a jacket on the Ferry! An important reason to drive to Orcas Island is so that you have a car on Orcas. None of the big name rental companies have a base on the island, and the one local car rental site I found seemed to no longer be in service. There is no Uber/Lyft, and taxis seemed few and far between (mostly locals running a taxi service during busy season). Take a Seaplane from Seattle. Here is more information to plan your ride! This is more expensive than Route #1, especially if you don’t already live in Seattle. 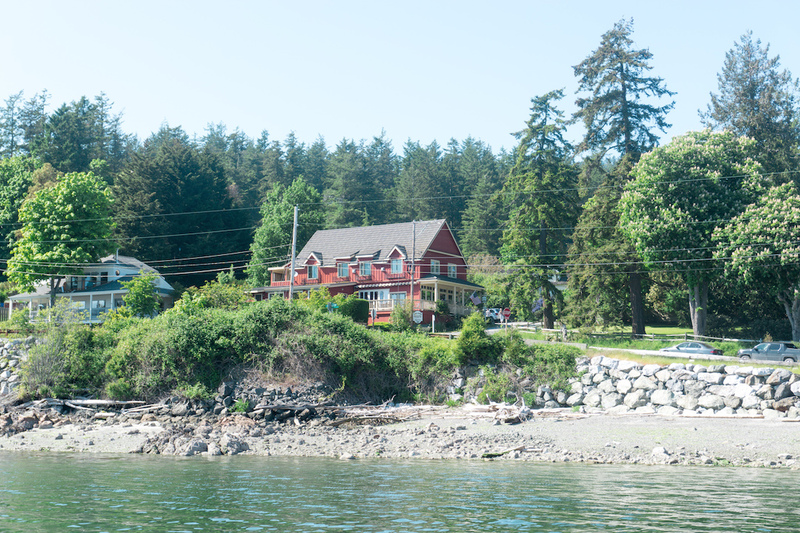 Orcas Island has a few cute Inns and B&Bs. Eastsound is the “downtown” area of Orcas, which consists of one main street and a few adjoining side streets. It’s a very cute downtown, and if you would like to stay here, I would recommend the Outlook Inn. 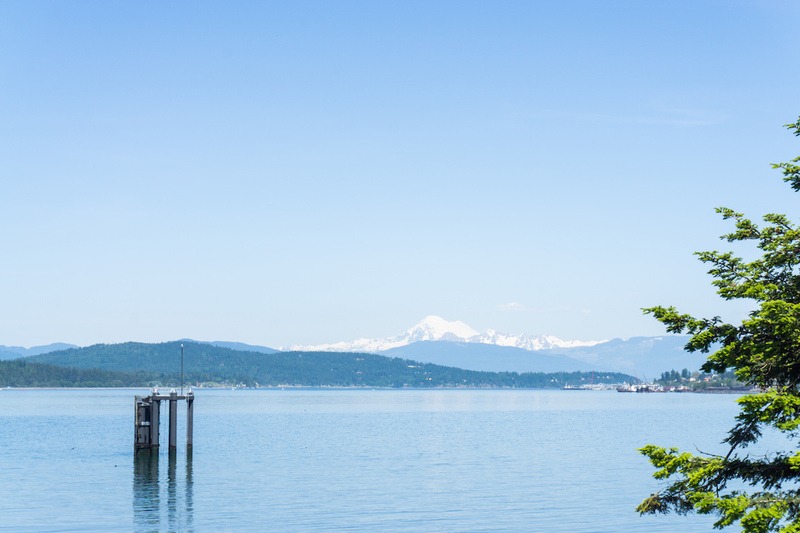 Westsound is a quieter area, with a dock and lovely views of the sailboats on the sound. 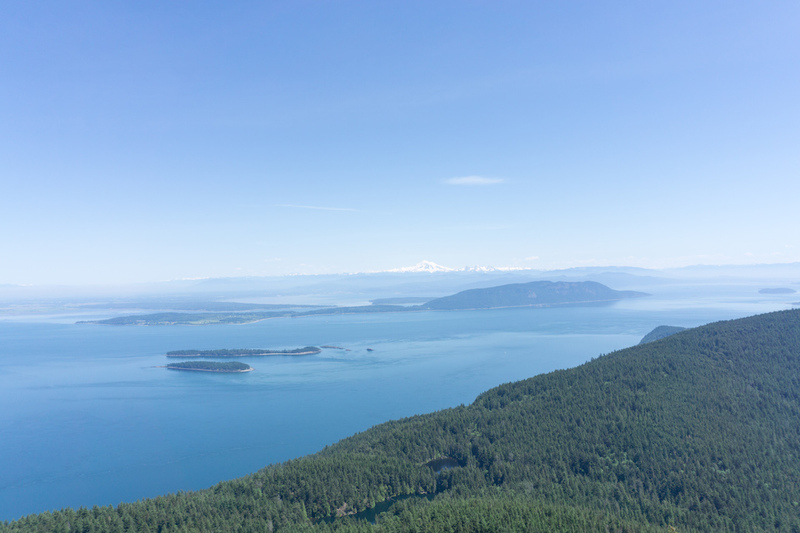 It is also close to Turtleback Mountain which is a must-do hike while on Orcas! We stayed in Westsound, at the Kingfish Inn. It was a lovely place to stay, and I do recommend it, especially for the price. However, the rooms are right above the Westsound Cafe, and in the evenings you can smell the frying in re-used oil, which is not pleasant. If you have a sensitive nose, choose somewhere else to stay. If you are after resort style accommodations, you could try Doe Bay Resort or Rosario Resort. Doe Bay resort also has yurts for a glamping option! Another great option is booking a private home through Airbnb – but book early because they run out soon! 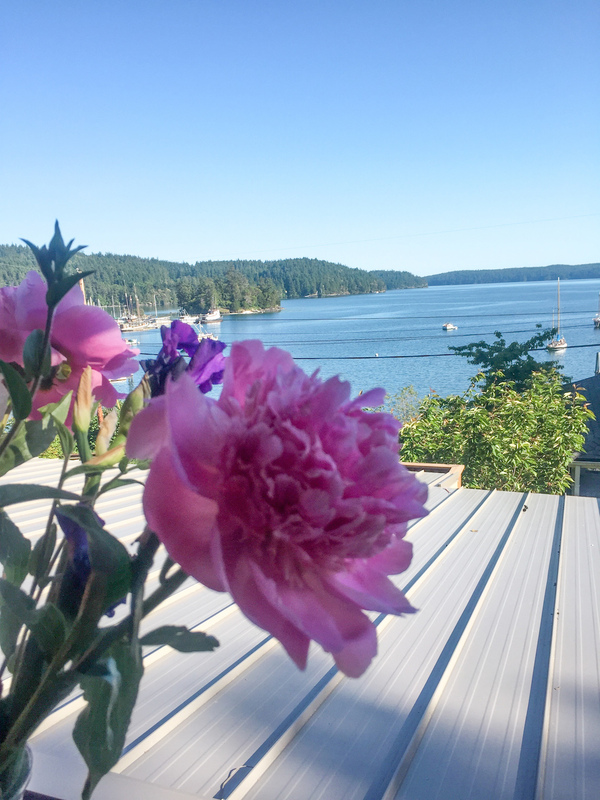 I’m just going to come straight out with it – if you are looking for a foodie trip, or require fine dining, then Orcas Island may not be for you. In general, we had some hit and miss experiences with Orcas Island food, but some restaurants were definitely better than others! 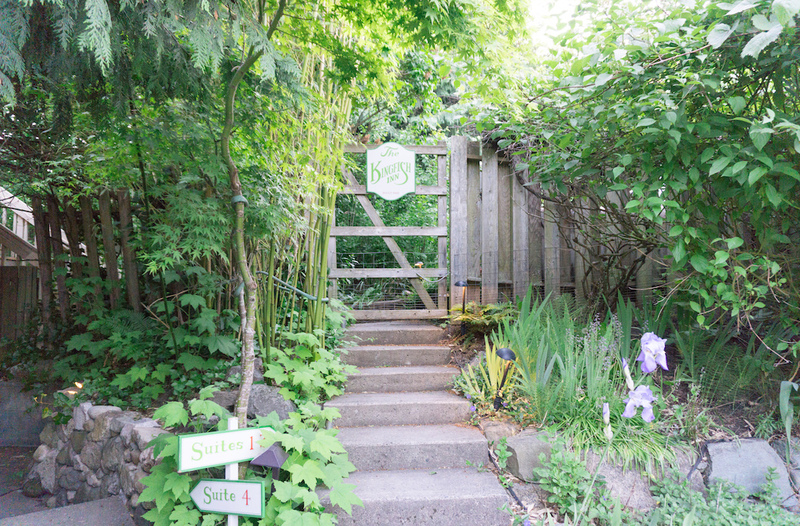 Rose’s Bakery and Cafe : This was my favorite place to eat on Orcas! Their bakery has fresh and yummy sandwiches (the veggie baguette sandwich was delicious), and amazing chocolate croissants. This is the perfect place to pick up food for a picnic, they also have a large selection of wines and cheeses! Note : This place is genuinely good, like, it would be good outside the island also. New Leaf Cafe : We ate dinner at New Leaf, and it was quite good. The prices are a bit steep, but the dinner is definitely one of the best we had on Orcas. 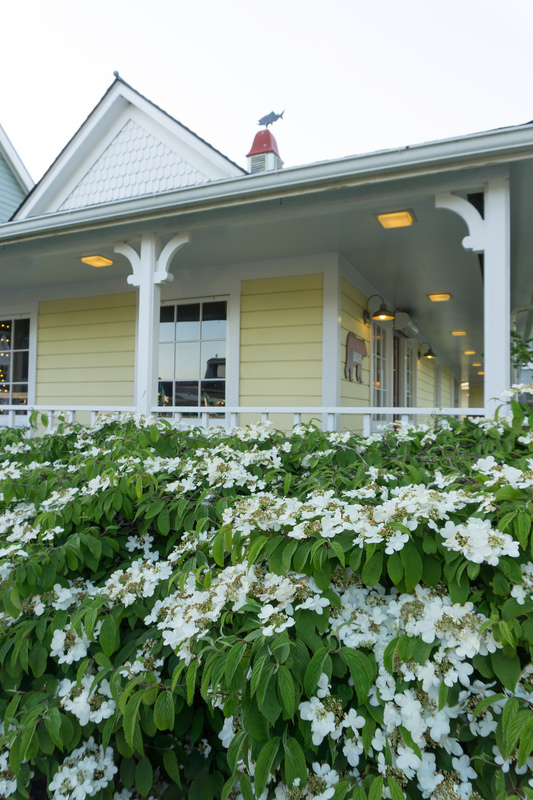 Sit outside, and enjoy your dinner with a view! 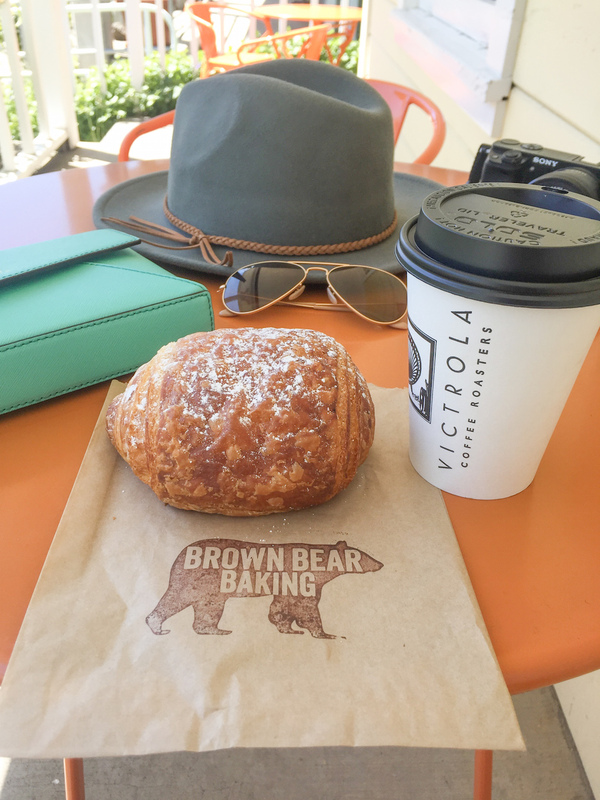 Brown Bear Baking : Pretty decent sandwiches and baked goods, but if you had to choose, pick Rose’s. 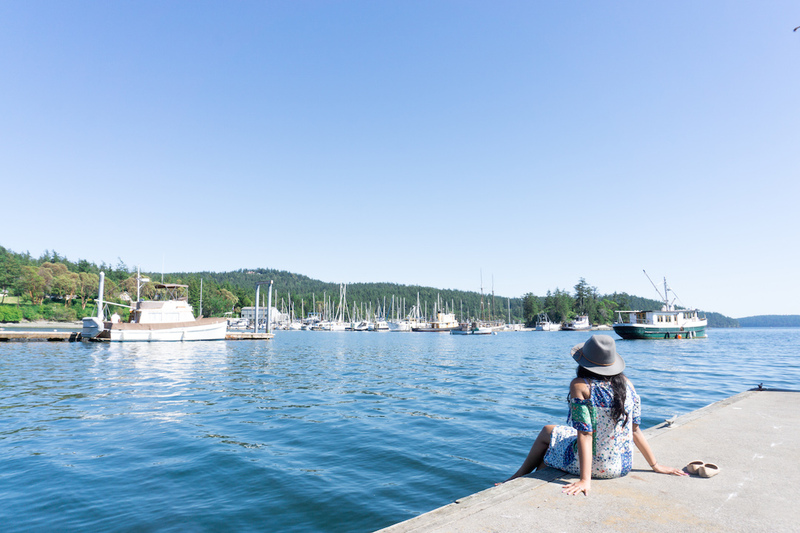 Orcas Island has so much to offer for every type of traveler! (Except foodies, see above). It’s both romantic and kid-friendly (almost everyone we met in Seattle said they’d been to Orcas as kids). Whale watching, kayaking, hiking, biking, walking through the one main street are all fun activities to do on Orcas. You can spot whales near Orcas Island year round, especially the famous Orca whales. 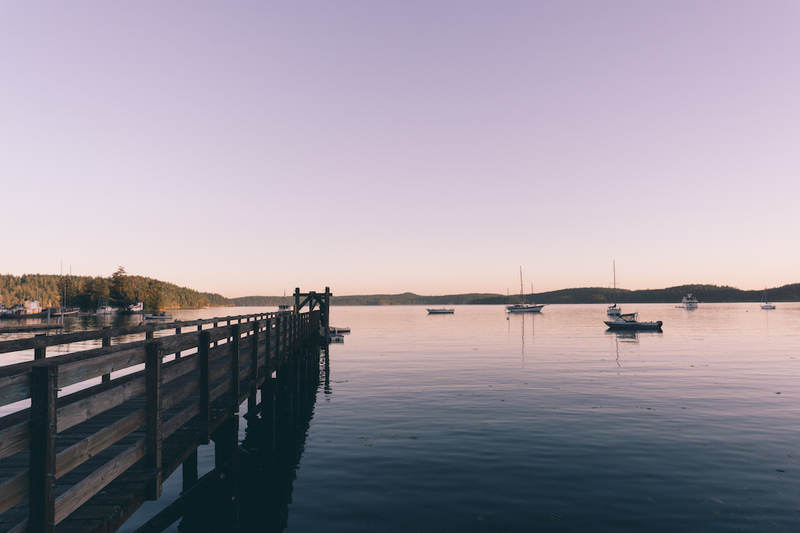 Fun fact : Free Willy II was filmed on the San Juan Islands! 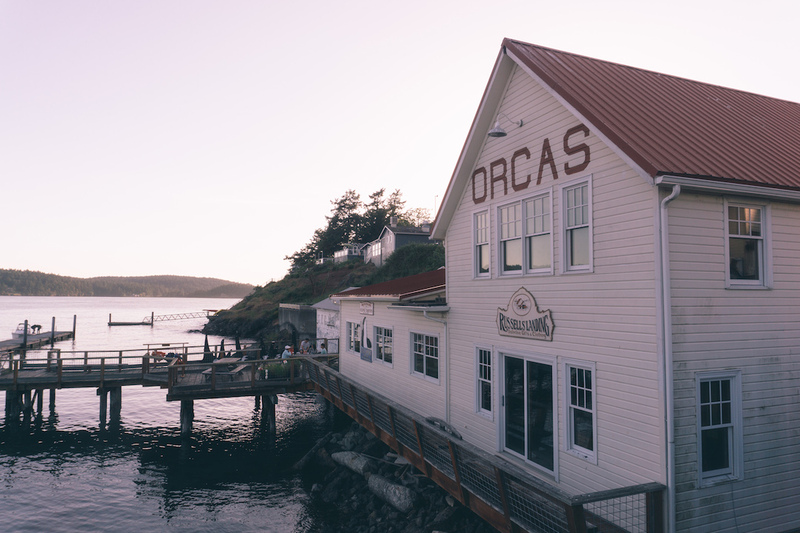 Fun Fact II : Orcas Island is NOT named after Orca whales, the name actually comes as a shorted form of Horcasitas, the Viceroy of Mexico who sent an expedition to the San Juan islands in 1791. A whale watching tour is the best way to spot the Orca (and other) whales. A couple of highly reviewed tours are Outer Island Expeditions and Deer Harbor Charters. If you are looking for a bit more adventure, try the kayaking whale watching tour! 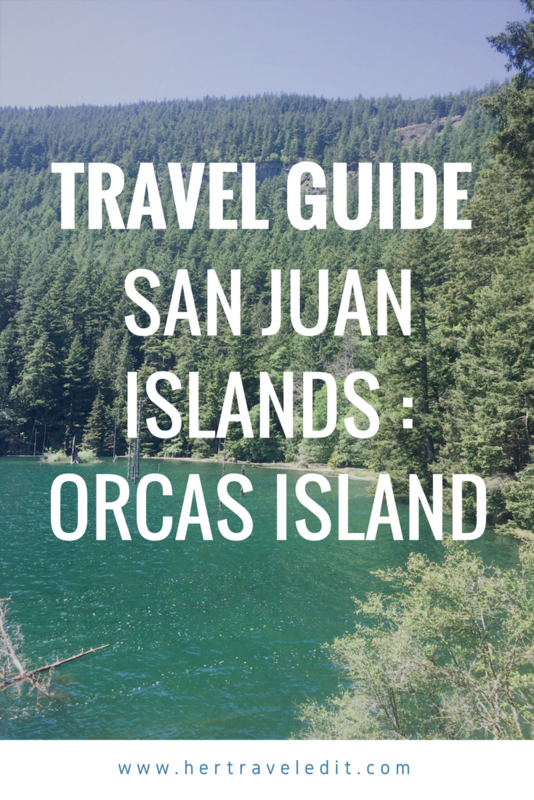 Note : If you are very interested in kayaking with Orca, I actually recommend heading to San Juan Island (another island close to Orcas) to book a Sea Quest whale kayak tour. Plan to spend at least a few hours whale watching, and half-day / full day for kayaking. 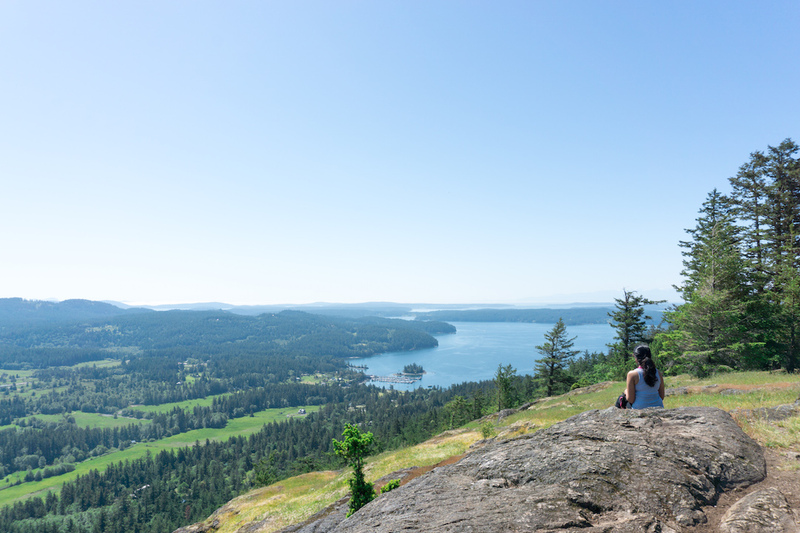 Turtleback Mountain is a must visit place on Orcas Island! 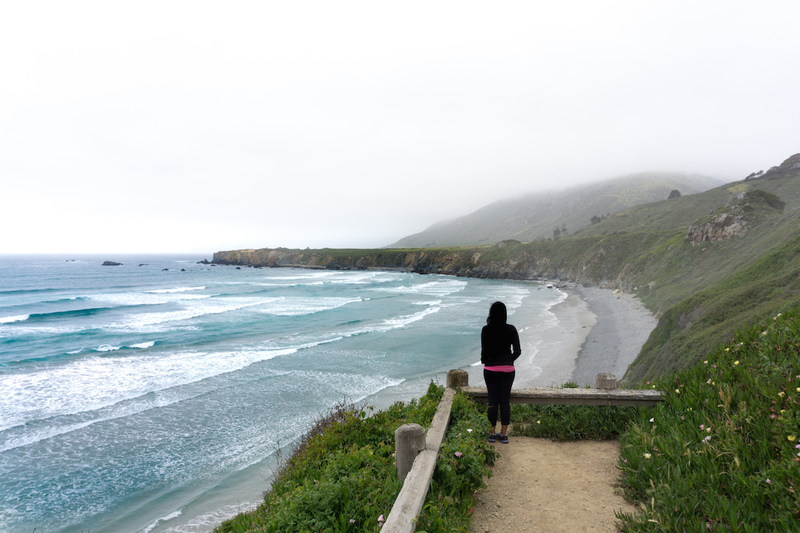 This was my favorite hike on this trip, and maybe even my favorite hike ever? I loved it because it is challenging enough for you to feel accomplished, but not too challenging to make you feel discouraged. And the stunning views start about 3/4th of the way to the top, and just keep getting better. Another good reason to love it is that it is not crowded, especially if you go earlier in the morning. We started at the South Trail head, and headed to the Lost Oak Trail. I recommend climbing up through the trees to Ship’s Peak and then saving the stunning views for your downhill climb later. 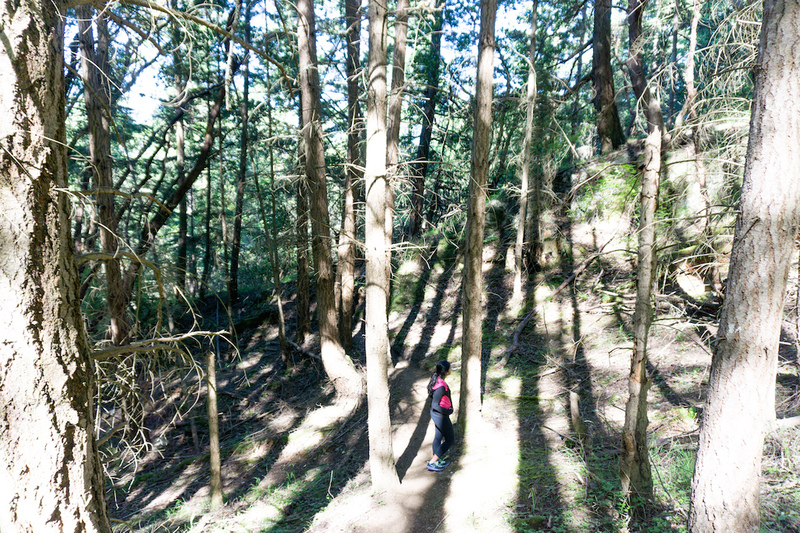 The Washington Trail’s Association has a handy guide for your Turtleback Mountain hike. We spent our last half-day at Moran State Park. There is so much to do there, that I’m sure we barely scratched the surface. You could actually camp at Moran State Park (but the campsites always seem to be full!). We started at Cascade Lake, we headed to Cascade Falls. 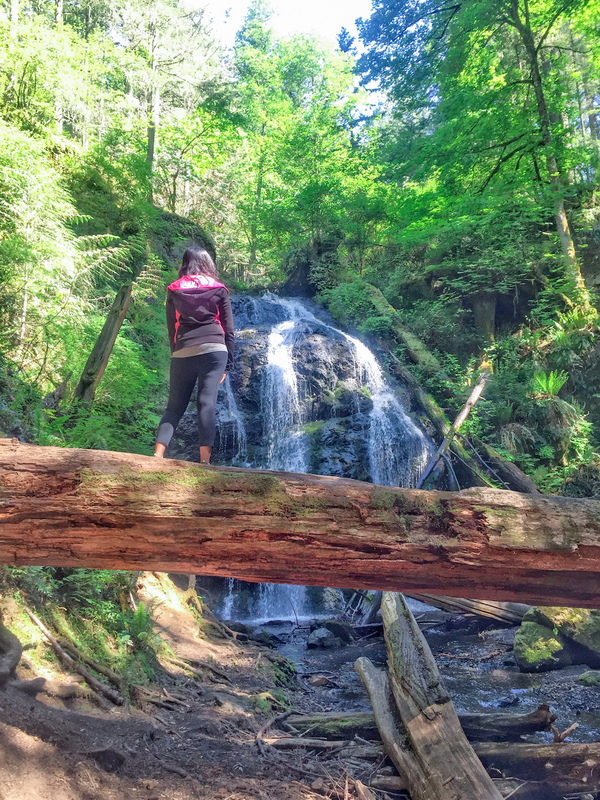 The Cascade Falls trail is a short hike downhill to view the lovely Cascade Falls. Of course, you have to walk back uphill to get to your car (parking is available off Mt. Constitution Rd., follow signs for Cascade Falls), but this is not strenuous at all. After witnessing the beauty of the Falls, we decided to walk around Mountain Lake. This is a 4 mile, relatively flat loop, to the point where calling it a hike might be incorrect. Rather, think of it as a pleasant, slightly undulating walk around a blue – green lake, amidst trees, butterflies and some birds. 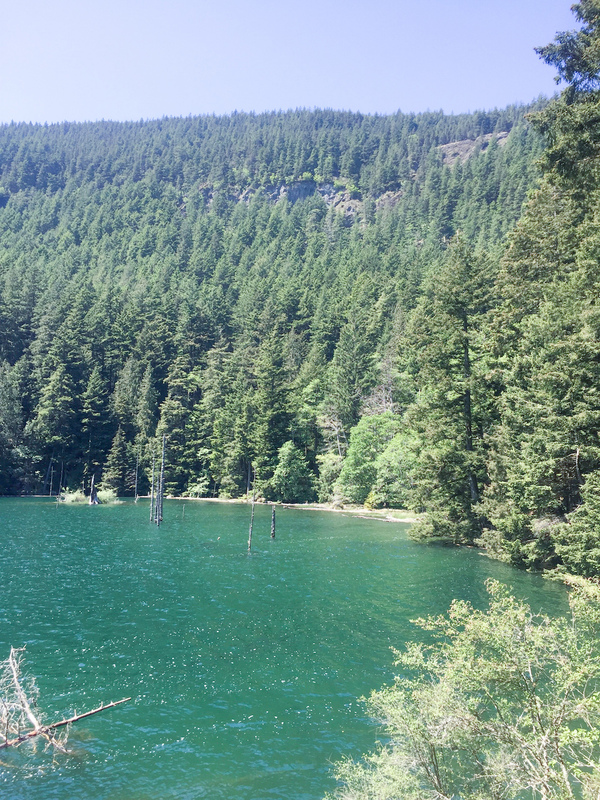 I admit there were some points on the trail when I wondered if it would be easier to swim across the lake and get it done – but resist the urge. The walk is definitely fun, especially if you bring some snacks! 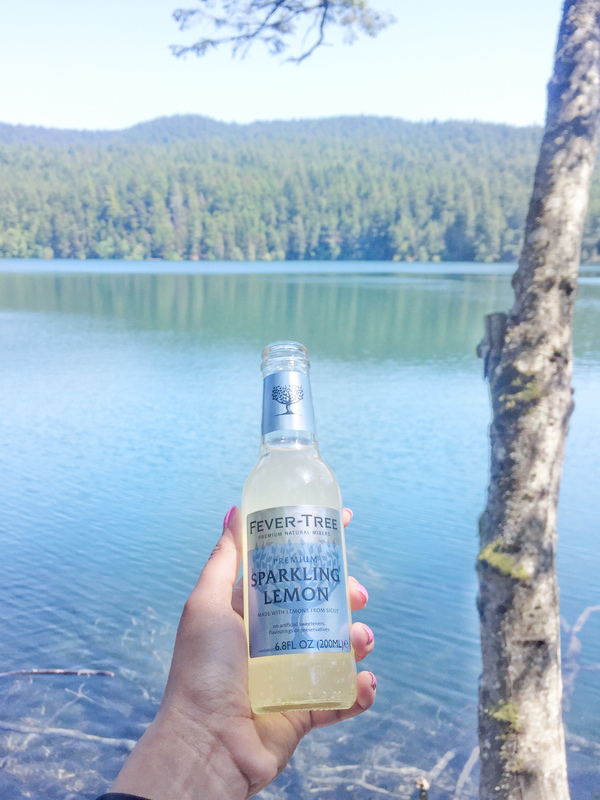 The best reward after a hike! Finally, we drove to the top of Mt. Constitution, the highest peak on the San Juan Islands. Yes, you can hike up Mt. Constitution, but we were short on time (and let’s face it, short on stamina as well). The views from the top are stunning, but know that it does get very crowded here. 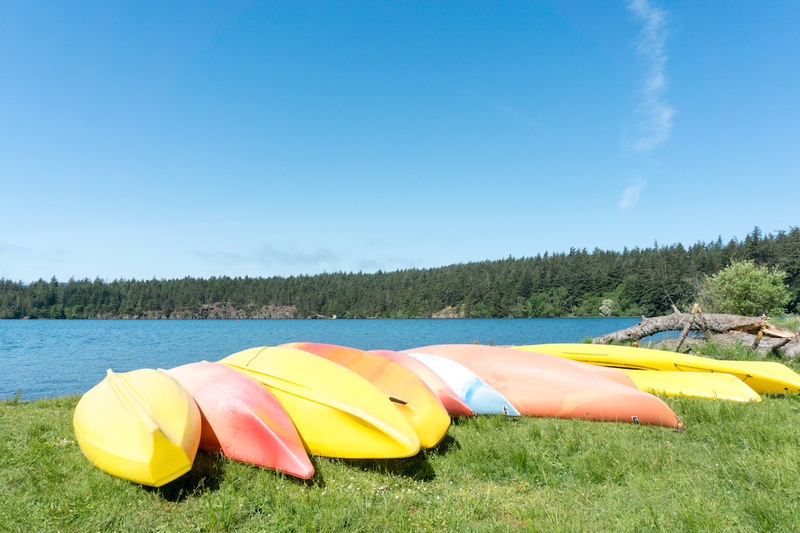 Kayaking is a fun activity on Orcas Island, either for whale watching (as mentioned above), or in Moran State Park on the lakes. If you do kayak in the sea, please remember that the water temperatures are very low, and falling in might be fatal due to hypothermia. Read this guide on hypothermia before sea kayaking. 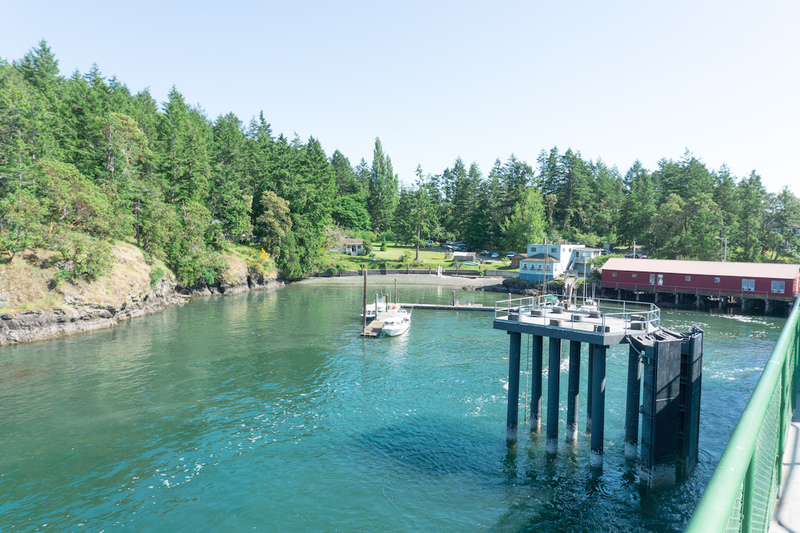 Eastsound is Orcas Island’s “busy” area. The main street has cute boutiques, restaurants, a bakery and even an ice cream shop! All the while, you get lovely views of the sound, and Indian Island, a tiny island off the shore. The tide is low enough to walk to the island from Eastsound for only forty (non consecutive) days in the year, and we were lucky enough to be there during one of those days! The rocky island is an ecological reserve, and was very cool to walk around. Eastsound is just a pretty place to walk around and hang out. There isn’t too much going on, but there is enough to feel simulated! A perfect balance. 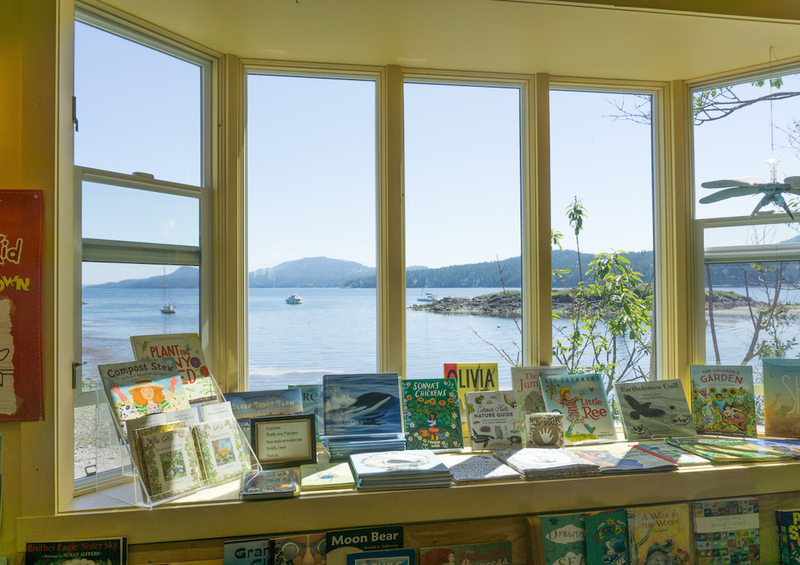 Darvill’s Bookstore is a must-visit while on Orcas, even more so if you love books. 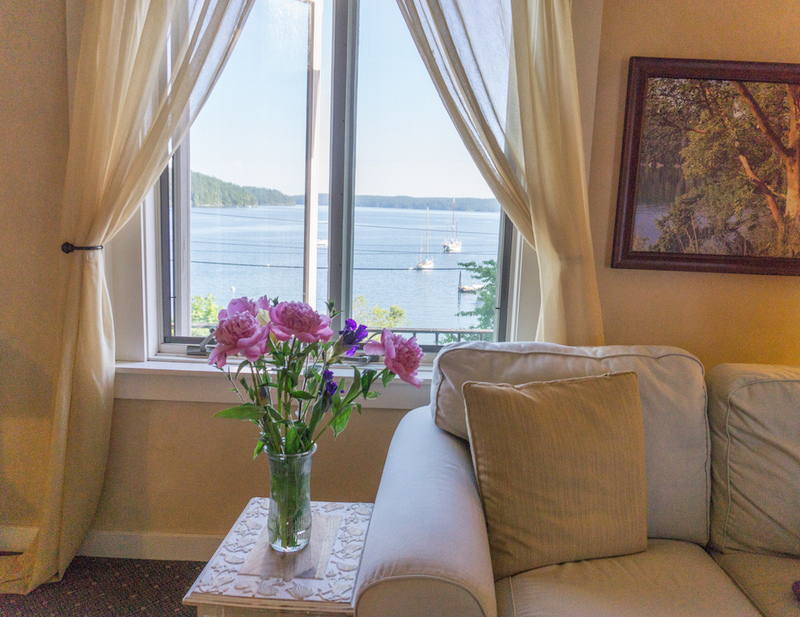 It’s a pleasant way to spend half an hour (or more, no judgement), definitely head to the back to get a lovely view of Eastsound from the bay windows! This is where I saw the book “The Little Book of Hygge”, which is about the Danish way of happiness and contentment. 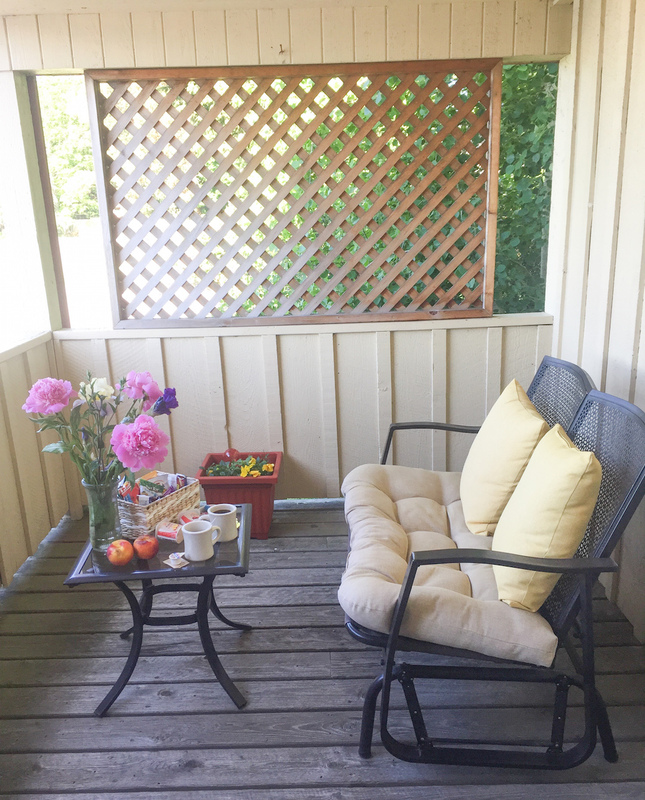 Hygge is a feeling of contentment, of being safe and cozy, at home. In that bookstore, and on Orcas Island, I felt hygge. We stayed near Westsound Harbor, so got to spend some time there. It is more peaceful than Eastsound, and watching the boats glide in and out is very therapeutic. The drive along Westsound, on Deer Harbor Road is beautiful, and even if you don’t stay in the area, I recommend at least driving by. It is a small island! 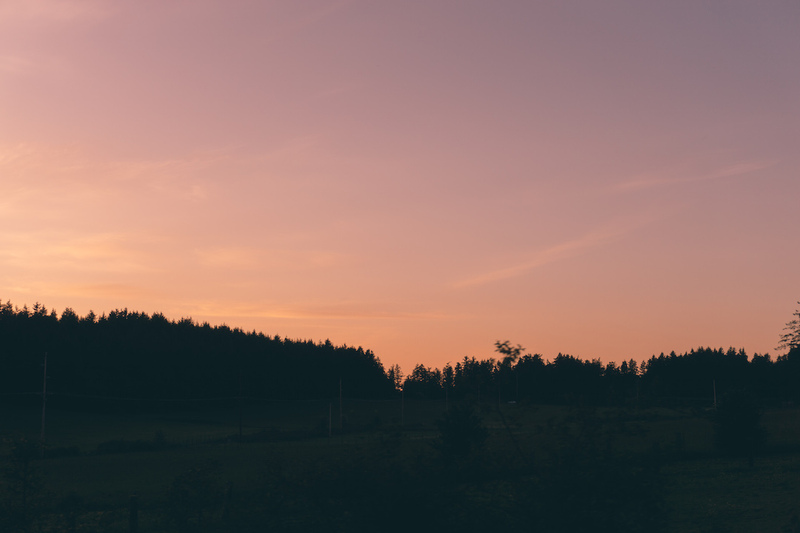 I highly recommend driving around the island just before sunset to really get a sense of life on Orcas Island. I described this drive at the beginning of the post, simply because it was when I fell a little bit in love with the Island. Good company and good music are just the cherry on top! The most obvious reason to visit Orcas Island would be to catch a close-up view of the Orca whales. However, do you want me to let you in on a secret? We didn’t even see an Orca whale on our trip! 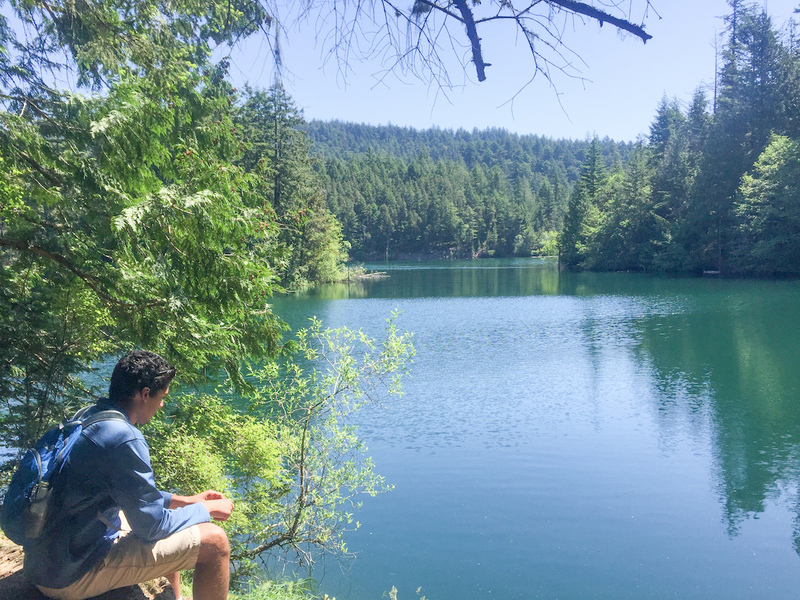 I think there is so much more to Orcas Island that makes it a worthwhile weekend trip – the lovely views of majestic mountains and blue seas, the calm drives through lush greenery, the gorgeous hikes, Canadian radio and the cute yellow bookstore. It’s a place for adventuring and exploring, all the while feeling very safe. You know, kind of like being a kid again? 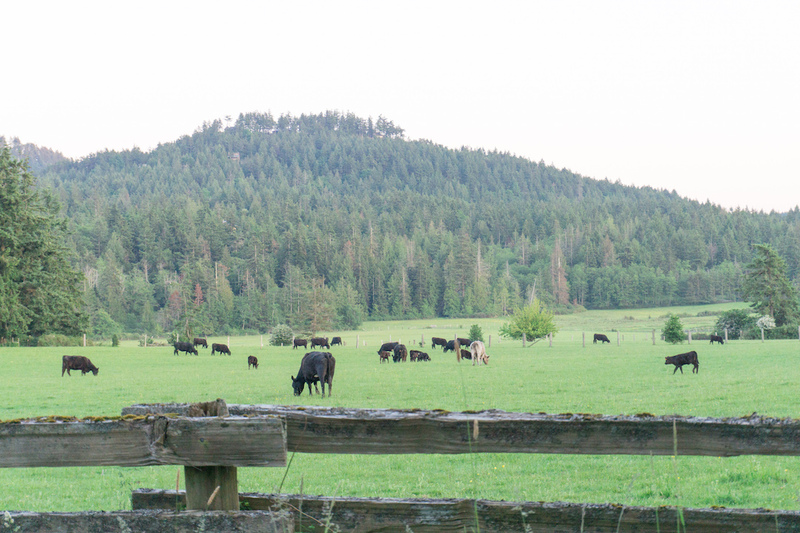 The theme for our travels in May seemed to be rural retreats, so Orcas Island was a perfect fit. We came back refreshed and invigorated after our long weekend on this beautiful emerald isle, our bags full of lavender, our heads full of calm blue waters, lush green fields and trees, and a yearning for Canada, who we have still not seen. Yes, we should go sometime, you'd love it! Thank you!! It’s truly an amazing place! Hope you get to visit sometime! Wow, your pics are beautiful! 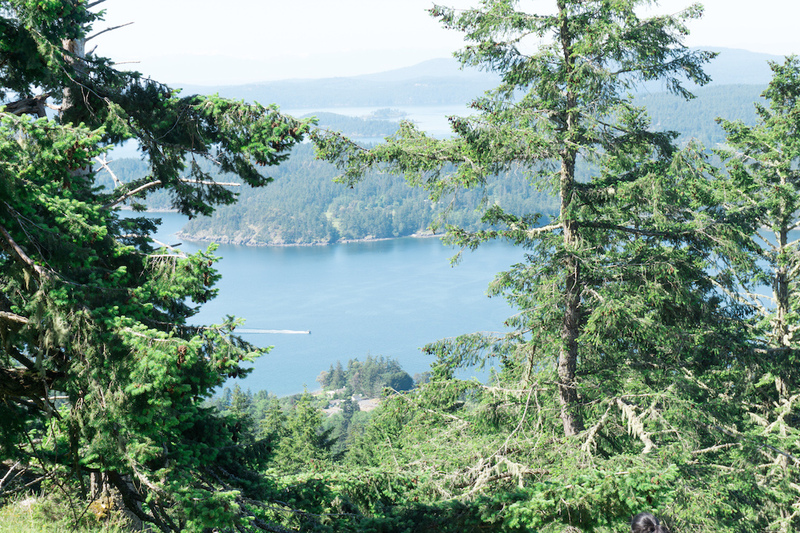 There definitely seems to be more to do on Orcas Island than actually go whale watching. And you mentioned my favourite newfound activity, kayaking! A beautiful spot to go to! Ahh I love kayaking too!! Fun way to get some exercise! I really wished we could have crossed over to Canada to see what it’s like! This looks like such a charming island town! 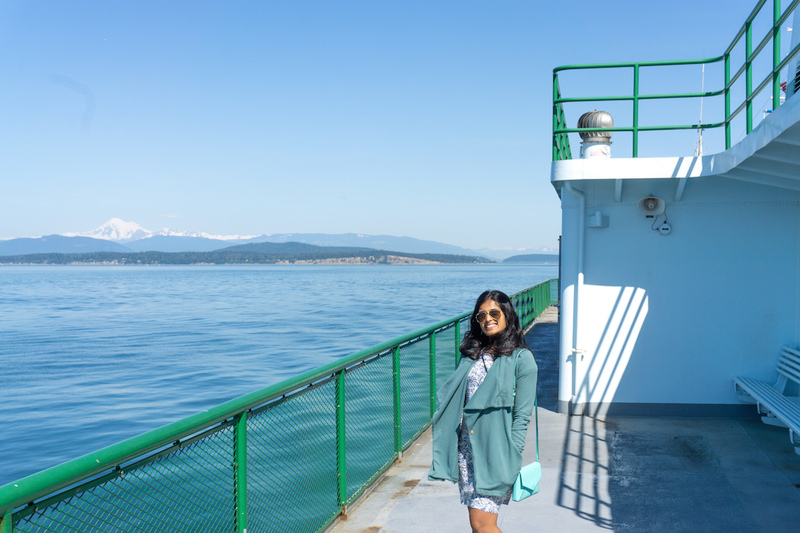 I love traveling by ferry and oh my goodness those hikes look breathtaking! Great photos too by the way, definitely adding this to the bucket list! Aww thank you!! 🙂 Yes, the ferry ride was really nice! That is a pretty impressive list of available activities! I feel like I would need a full week to get in all the hiking, kayaking, and photography there is to offer! hahah, yes, the luxury of a week there would be so amazing! I’ve never heard of this island, but it sounds like such a cool destination! It seems so quaint and quiet! Kayaking with wales sounds like a blast, seriously a bucket list-worthy adventure! Yes!! This island is amazing, I truly can’t wait to go back! Wow what a really detailed and well written post. I am kicking myself that I didn’t know about Orcas Island when I was living in Seattle. Although Washington State is so beautiful and it is hard to see everything. Thank you! Aww, hopefully you can go back sometime soon! Wow, beautiful pictures! Honestly, I didn’t even know about this place and it looks absolutely breathtaking, perfec t for a weekend getaway. Thanks for sharing your experience there! Thank you!! 🙂 So happy my description was good enough for you to visualize! 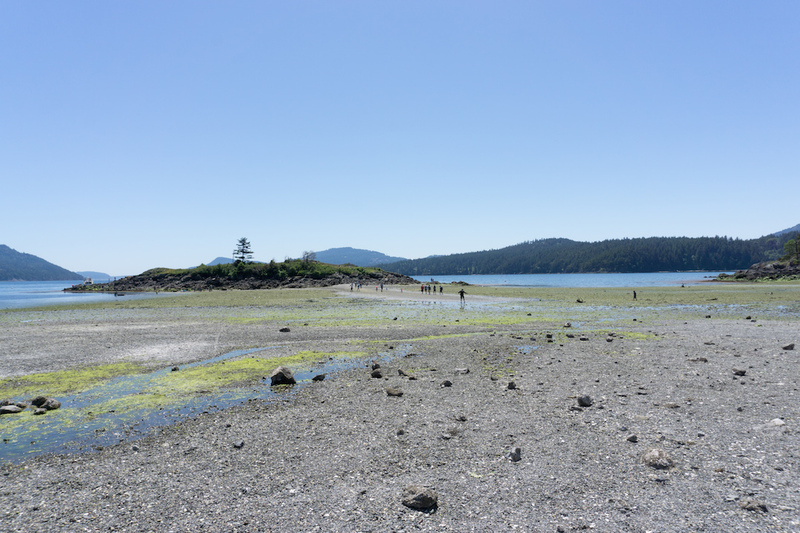 Hope you can visit Orcas Island someday, it’s just amazing! Wow, this place looks amazing! I had considered going there last fall, but the weather wasn’t looking too great at the time! I’m glad weather was on your side because you look nice and dry in your hiking and kayaking photos! Great post! hope you get to visit sometime, I’d love to go back and explore some of the other islands too! When I was a kid, I loved the book Sixth Grade Can Really Kill You by Barth DeClements (great name, huh?). At the end of the book they go on a school trip to the San Juan Islands. I’ve been intrigued ever since! Thank you for your beautiful pictures and descriptions. I’d love to tie this in with a trip to Seattle and Vancouver. Oh that is so cool!! I’m glad the title did not come true hahah. But yes, this is a perfect add-on to a Seattle-Vancouver trip! You guys are always traveling to some beautiful nature! This is exactly what I want to visit when we get to the States one day. 🙂 And if I see the orcas, well it will be a perfect trip (actually I dreamed about seeing orcas in the sea the other night). 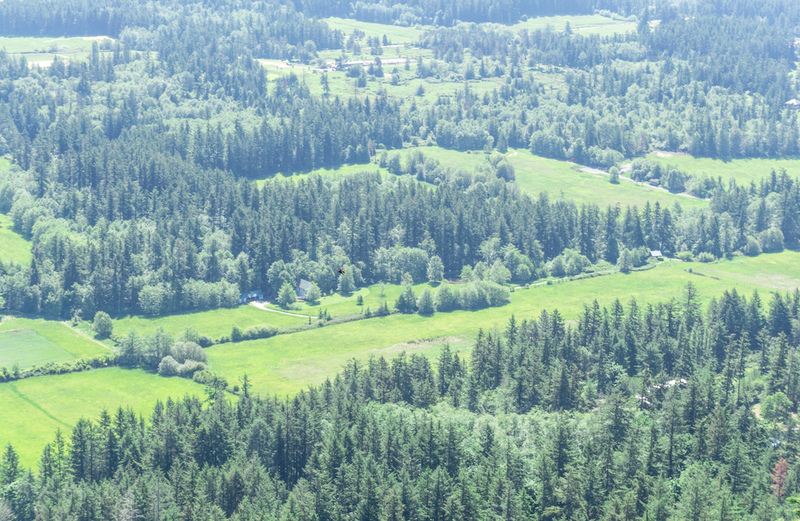 The view from the Turtleback mountain is just amazing, reminds me a bit of Austrian Alps and lakes. Also, love that bookstore. Also, love Fever-Tree tonics. 😀 Oh, and Hygge is so popular right now with some of my friends, we even had a hygge gathering in a park here in Zagreb. With marshmallows and all. Aww Anja, I hope you get to visit the US soon and do all the nature things! It is so gorgeous! It’s been a long time since I’ve been to Seattle. The snow up there was crazy a couple weeks ago! My brother has been there for a couple years and he said it was the most snow he’s ever seen. 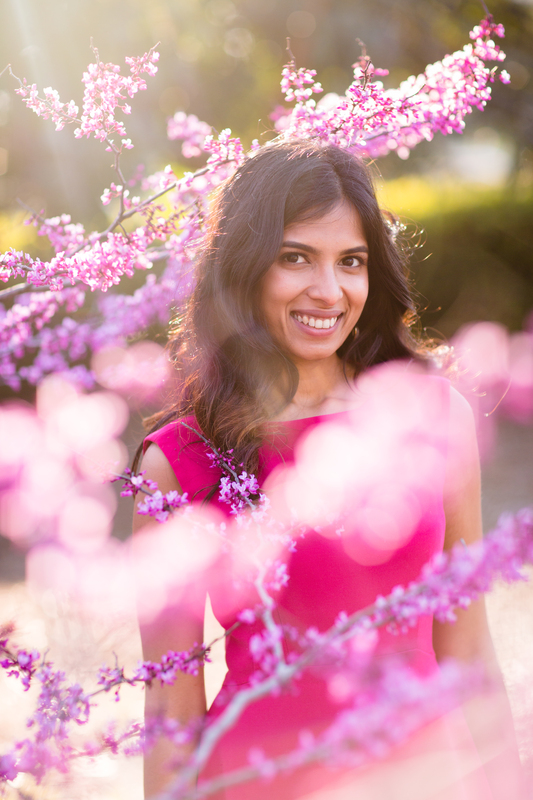 I’m glad spring is right around the corner.